Last week I attended Mickey's Very Merry Christmas Party. It's been 15 years since I attended my first party, which was also the last time I attended the hard-ticket event. I remember that first event well, and enjoyed the time with my family, which was much smaller group at the time. Two of my children were not yet born, and a third was an infant. 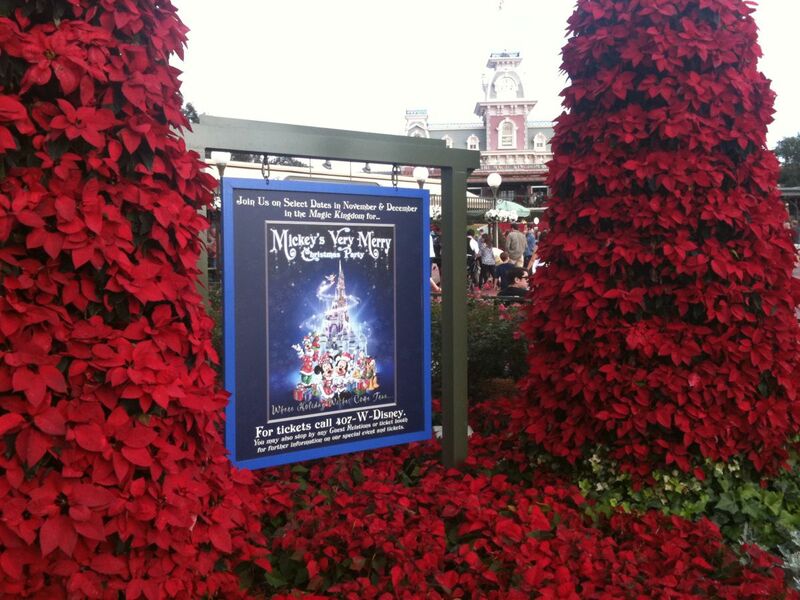 Signs and pointsettia trees promote the upcoming Very Merry Christmas Party. Photo by J. Jeff Kober. I also remember it being much colder on that occasion than the warm temperatures I enjoyed last week. Of course, I attended in mid-November rather than mid-December, a good reason why one would get in the holiday spirit before carving your Thanksgiving turkey. The event has not changed too much since we first attended. A terrific parade, beautiful fireworks, complimentary cookies and cocoa, and snow on Main Street, U.S.A. But there are some differences. Back then there was a complimentary photo. Now there are PhotoPass folks and more exclusive meet and greet opportunities with Disney Characters you don't normally have an opportunity to see. But the biggest difference of all between now and then are the enchanted Castle Dream Lights we now see on Cinderella Castle. Cinderella Castle, draped in Dream Lights. Photo by J. Jeff Kober. 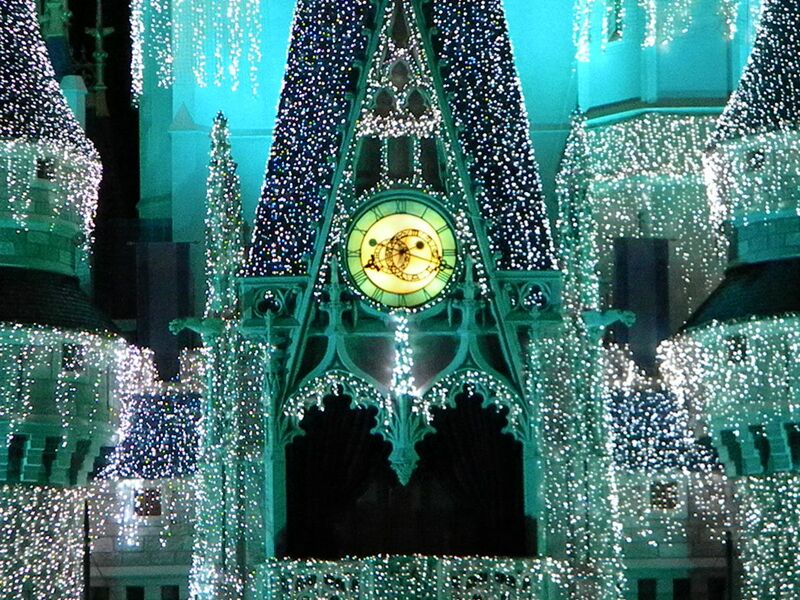 Changing colors through the night, Cinderella Castle stands as the centerpiece of the evening. Photo by J. Jeff Kober. That said, the general experience is very much the same: There's a great sense of merriment, and people having a great time. I've provided the following photos that capture the spirit of the event. 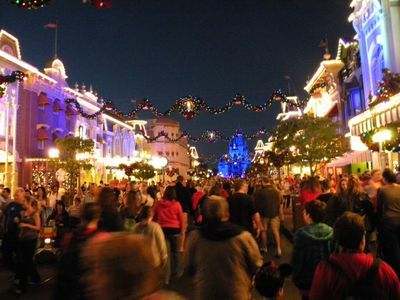 Main Street, U.S.A. comes alive at night for Mickey's Very Merry Christmas Party. Photo by J. Jeff Kober. 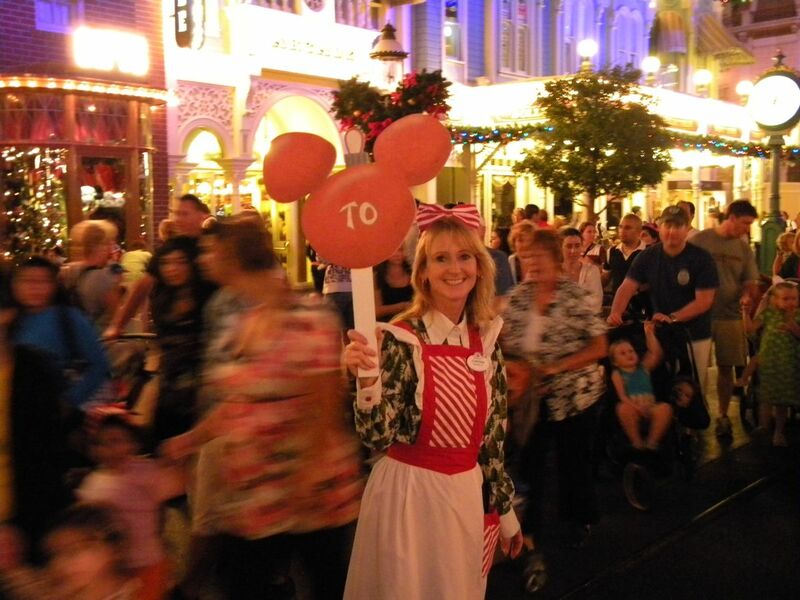 Decked out in holiday costume, this Cast Member does her best to direct traffic in and out of the park. Photo by J. Jeff Kober. The Crystal Palace, decked with holiday trimmings, becomes a lovely location to enjoy refreshments. Photo by J. Jeff Kober. 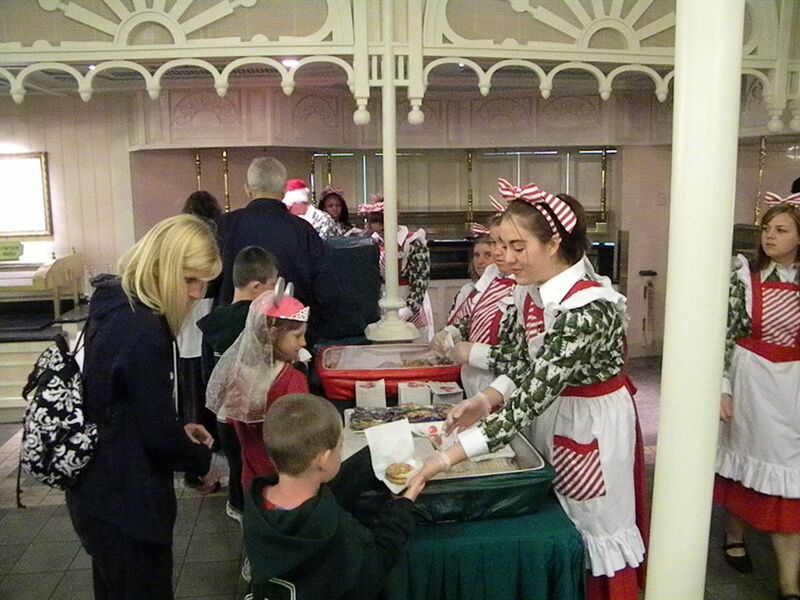 Cast Members serve cookies, hot chocolate, apple slices and apple juice. Photo by J. Jeff Kober. 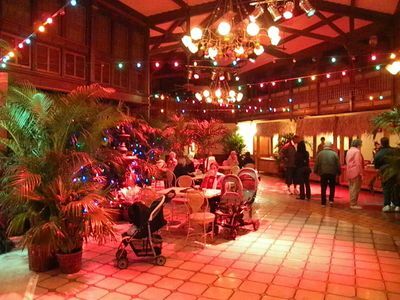 The Adventureland Veranda opens up during Mickey's Very Merry Christmas Party. The theme is a merger of Christmas and Caribbean. Photo by J. Jeff Kober. 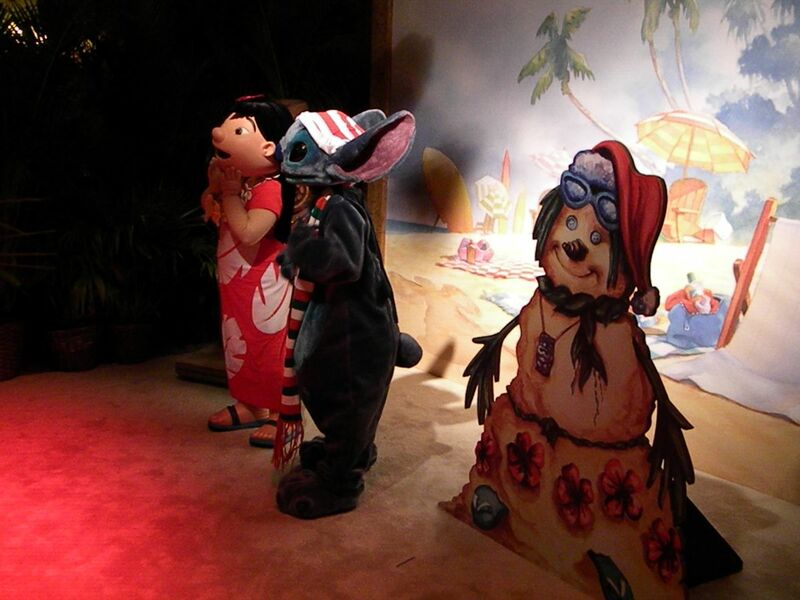 Lilo and Stitch greeting guests at the Adventureland Veranda. Photo by J. Jeff Kober. Guests crowd the streets as Mickey's Once Upon a Christmastime Parade begins. Photo by J. Jeff Kober. 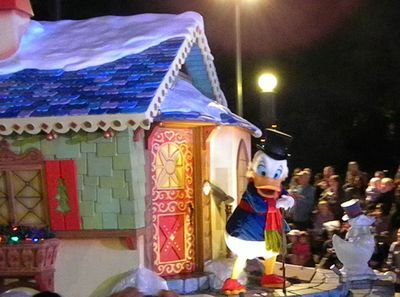 Scrooge McDuck holds court during the parade. Photo by J. Jeff Kober. 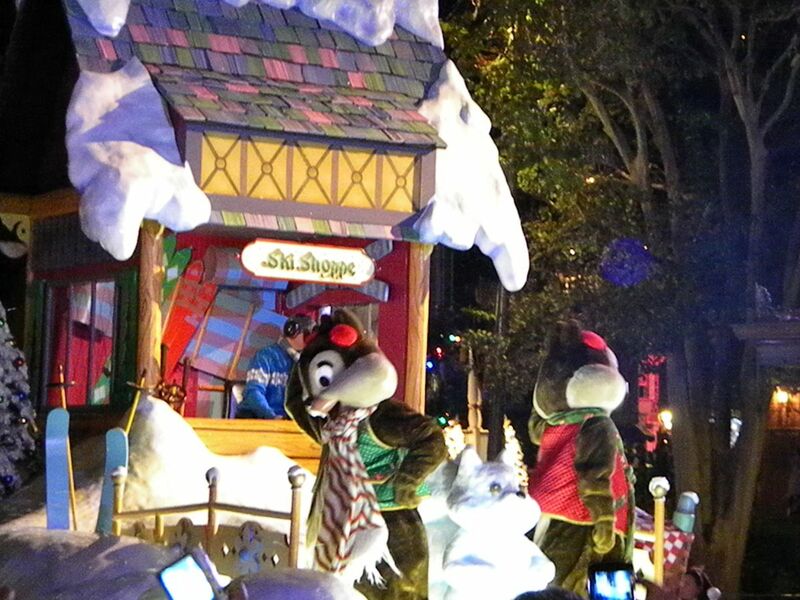 Chip 'n Dale hit the snow. Photo by J. Jeff Kober. 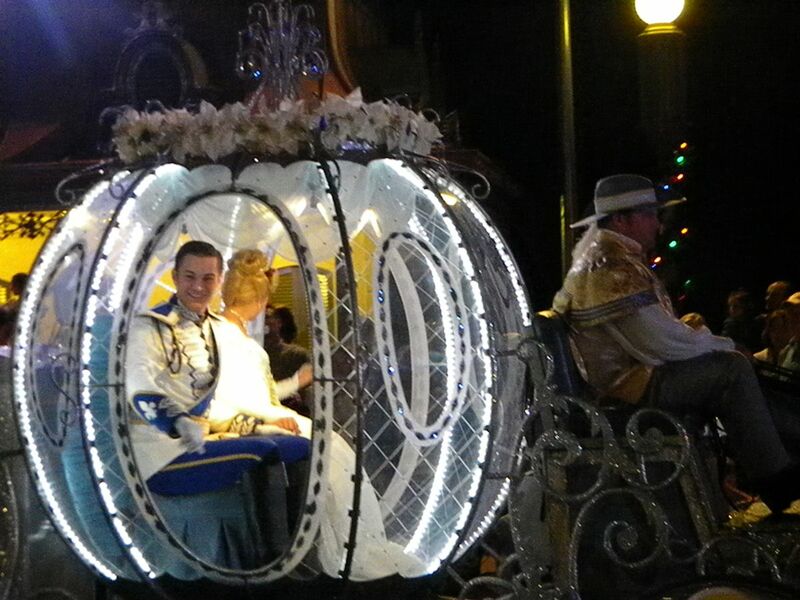 Cinderella and Prince Charming are escorted by a team of miniature horses. Photo by J. Jeff Kober. 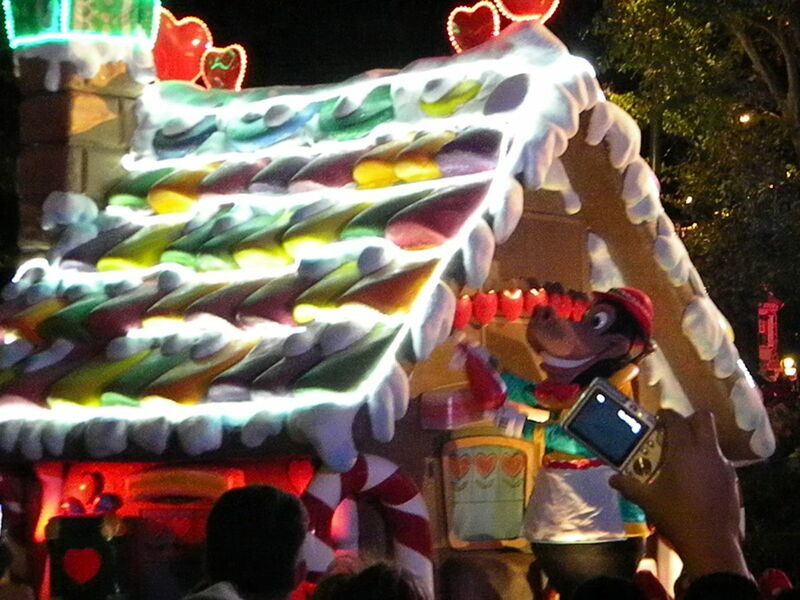 Clarabelle Cow waves from the Candy House. Photo by J. Jeff Kober. 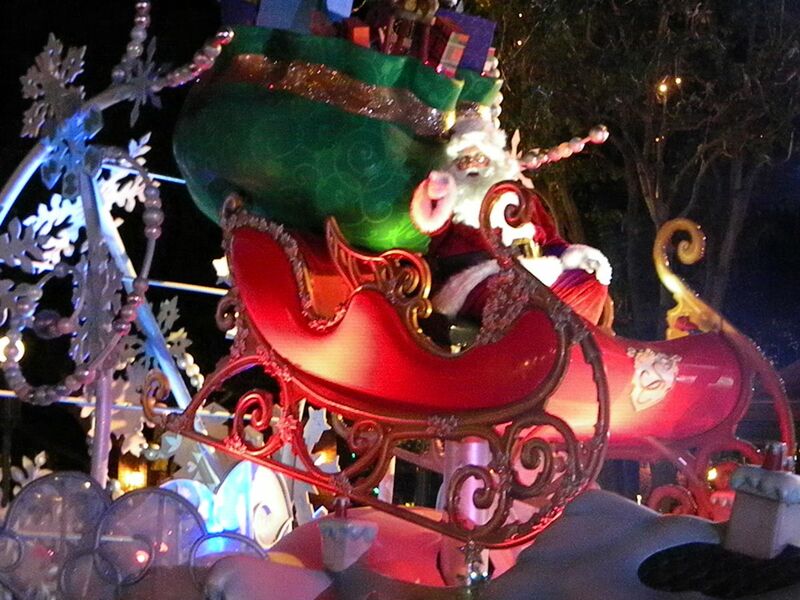 Santa brings up the finale. Photo by J. Jeff Kober. 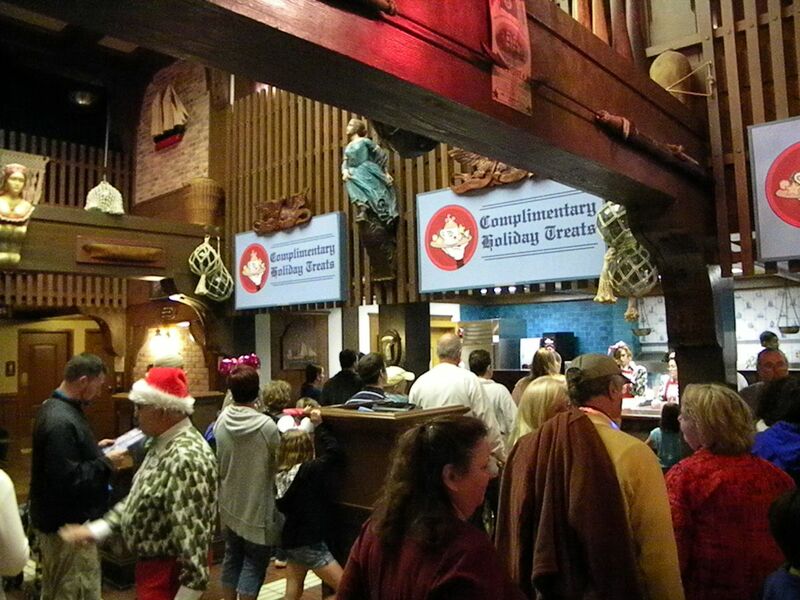 Business is brisk with refreshments served all night long at the Harbor House. Photo by J. Jeff Kober. 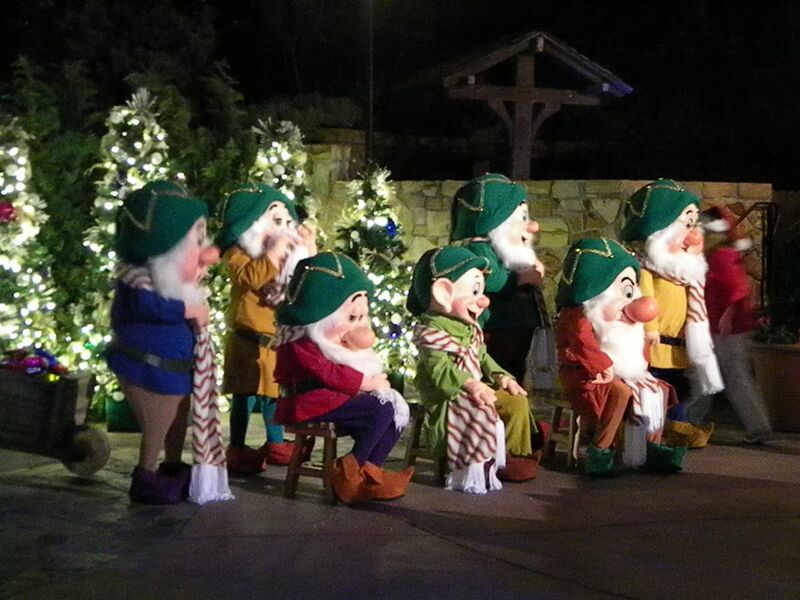 Lines are long for this rare opportunity to have a photo with all Seven Dwarfs. Photo by J. Jeff Kober. 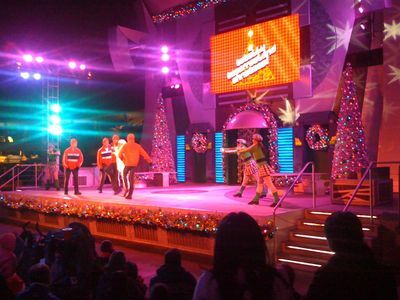 With the help of Stitch and Mike Wazowski, you get a Totally Tomorrowland Christmas Show. Photo by J. Jeff Kober. Holiday Wishes-Celebrate the Spirit of the Season is one of the key highlights of Mickey's Very Merry Christmas Party. Photo by J. Jeff Kober. 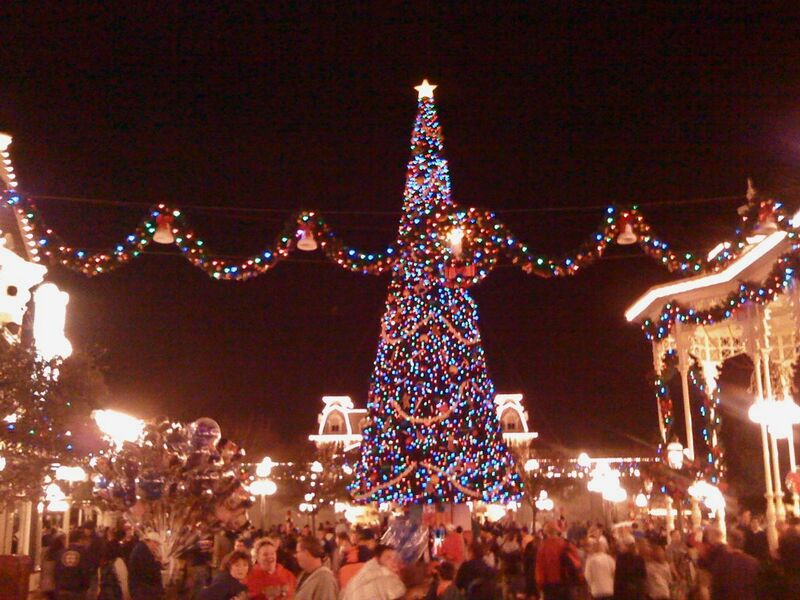 Guests file by the enormous Christmas tree in Town Square. Photo by J. Jeff Kober. Here's the hard question to ask: Is it worth the price? As always, it depends. If you attend during the busiest two weeks of the park, you get many of the offerings provided. 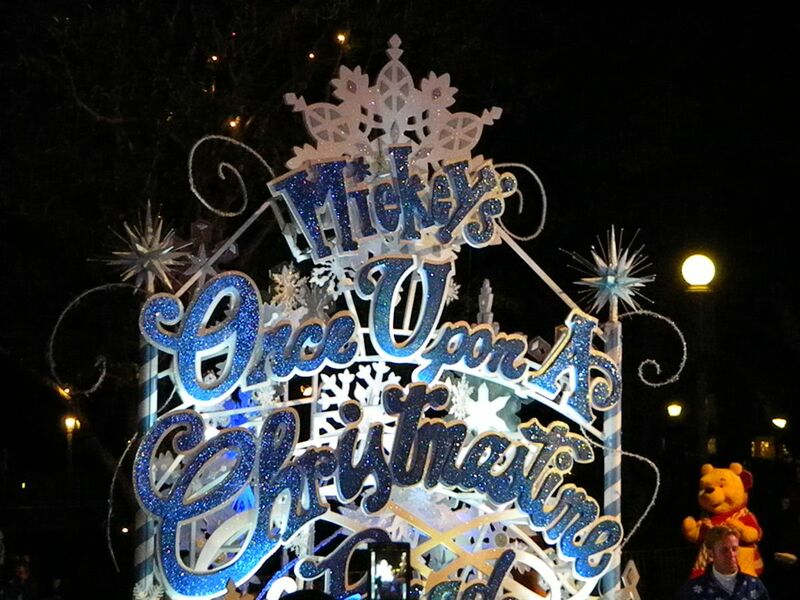 You'll see the two key anchors of the event: Mickey's Once Upon a Christmastime Parade as well as Holiday Wishes. You'll also see key entertainment. 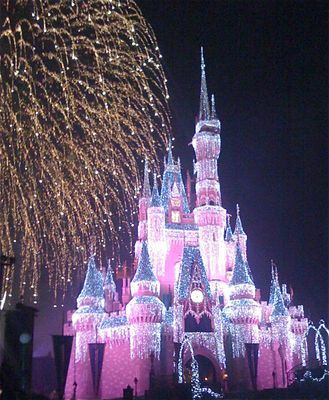 In fact, did you notice that the fireworks photo and Totally Tomorrowland Christmas Show photo were taken on a regular night between Christmas and New Year's Eve? They weren't taken during the party like the others. Moreover the last photo you see of the Christmas tree was taken during the same time—not during the party I attended in November. 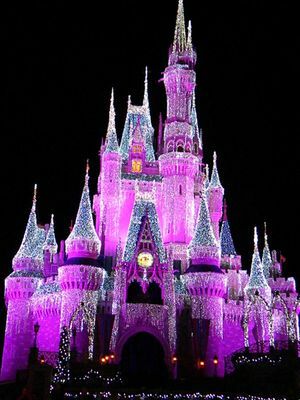 Because they want to get the desired sight lights with the castle during shooting, the tree doesn't get moved in until the parade is taped for the Christmas Day broadcast (which happens around the first of December). So if you want to see the tree, you'll have to come after that filming is done. All that said and done, the party may still be worth attending. In trying to see all this during the heaviest weeks of the year, you will experience a crush of people you have never imagined in your wildest dreams. Everything will move in slow motion because it will take longer to park, get on a tram, get on a monorail, get in the park, get on a ride, and so forth. Therefore, Mickey's Very Merry Christmas Party might be a right fit for you if you want to experience the joy and not the jam of the holidays. Indeed, by itself, it may be the best Disney value for really experiencing all the fun excitement that comes at this time of year—at least on the East Coast. But more of that comparison between East Coast and West Coast in an article to come. Stay tuned! I hate to do this, but I went to MVMCP last night. The picture of the christmas tree on main street USA square in not from this year because it is not their this year, at least not the night I went and I would think it would not be something they take in and out for no reason. From a cast member I spoke with, and Disney's standard procedures on how decorations get put up, they said it's not going to put it up. Could they be wrong? I hope so. The night I went they have replaced the tree in your picture with a photo op instead, that has the castle and decorated main street USA in the background. Now could they have taken it down for some reason and plan to put it back up? Who knows. But that is how it was on Nov 29, 2010. 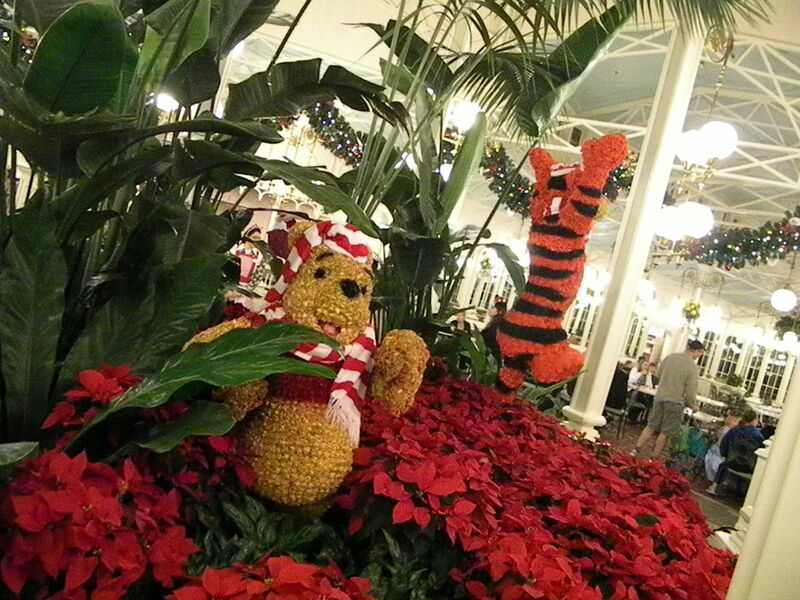 The reason is was also so clear to me is that it one of the decorations Disney does that I look most forward to and get a picture by every year. Admittedly, the photo op there is nice, but to me the tree is a tradition that is no longer there. I want to point this out to anyone else who is expecting it to be there, especially because of the misleading picture that IS NOT from this year. As for a positive note, the new show at the castle forecourt is the best they have done in years. There is a new technology where all of the characters on stage mouth moves when they are "talking". With eyes blinks, mouth movments, and it brings the characters truly into reality on stage. It remind me of the old "kids of the kingdom christmas spectacular" they use to have, but with a much smaller cast and budget. In fact, did you notice that the fireworks photo and Totally Tomorrowland Christmas Show photo were taken on a regular night between Christmas and New Year's Eve? They weren't taken during the party like the others. Moreover the last photo you see of the Christmas tree was taken during the same time�not during the party I attended in November. Because they want to get the desired sight lights with the castle during shooting, the tree doesn't get moved in until the parade is taped for the Christmas Day broadcast (which happens around the first of December). So if you want to see the tree, you'll have to come after that filming is done.